Oh, eyebrows, how I love you. At least, I love you when you look good. But making my brows look halfway decent isn’t always easy. They’re incredibly sparse, my right eyebrow has a random bald patch, and you know the saying Your eyebrows should be sisters, not twins? I’m pretty sure mine aren’t even related. Fortunately, the beauty world is as obsessed with eyebrows as I am these days, which means there’s a plethora of brow products I can try out. My current favourite? 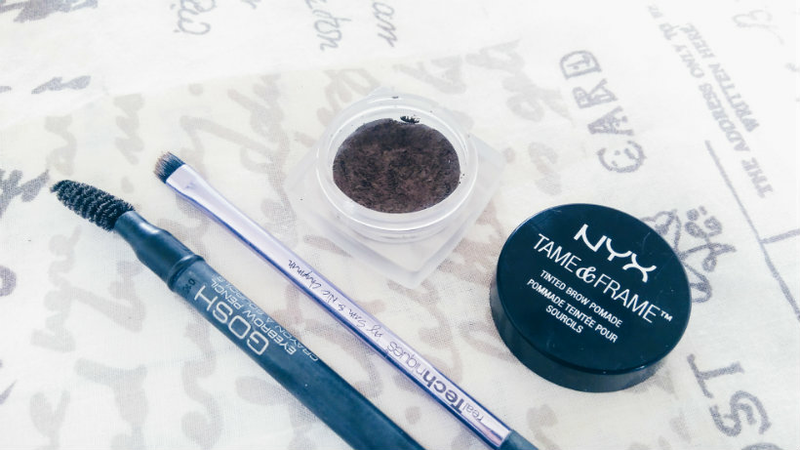 NYX Tame & Frame Tinted Brow Pomade, £5.50. I picked it up in Cardiff aaaaages ago but the shade I chose, 02 Chocolate, was far too light. However, the consistency was good and my curiosity hadn’t been sated, so I went on the hunt for the next darkest shade, 03 Brunette. And it’s a great match. I use the Real Techniques Eyeliner Brush* to apply a little bit of pomade, brushing it on in tiny strokes to try and mimic the appearance of the hairs and fill in the many, many gaps for a more even appearance. The pomade is thick and blends well, and once it’s in place it stays, lasting longer than almost everything else I put on my face. Lipstick? I have to reapply it after I’ve eaten. Foundation? My oily T-zone will see to that. But my eyebrows? They look fresh all day long. A word of warning: Too much pomade will give you a marker pen look, so only dab a teeny bit on the brush to save yourself the hassle of toning things down afterwards. Spoolies are highly underrated tools, in my opinion, and I always like to have one on hand. I’ve been using the GOSH Eyebrow Pencil in Brown, £5.49 — but not the actual pencil, which is too light. I seem to have a problem underestimating how dark my hair actually is! It’s a bit difficult to review a spoolie, truth be told, because they’re all basically the same. As long as they don’t fall off the end of the pencil then I’m good! I use them to brush my brows into place before I start and then again when I’ve applied the pomade. This gives the brow a more natural feel and also distributes the product if you’ve been a bit too enthusiastic while applying it (i.e. me every day). What do you use to fill in your brows? Are there any cruelty-free brow products you’d recommend? Let me know in the comments!